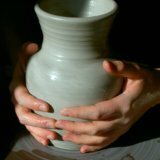 Build Pottery Wheel - There is an easy way and a hard way. 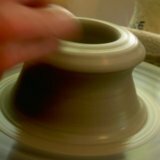 Of course the first time my friend and I built a pottery kick wheel we did it the hard way. We used scrap lumber and built the wheel from plans on the internet. Following the instructions, we propped up the plywood disk, which would eventually be the flywheel, and poured it full of concrete. As soon as we removed the blocks from underneath, the concrete cracked. To make a long story short, we used the wheel, but it was wobbly, rickety, and the concrete was crumbly. 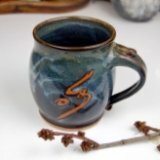 Then I discovered the pottery kick wheel kit from Brent Pottery. Brent Pottery makes a two part kit that includes everything you need to make a very solid, usable kick wheel. If you are a less than skilled woodworker like myself, this might be something to consider. For between $500 and $600 you can get everything you need to build it, including the wheel head, ball bearings, and all the pre-cut wood. On the other hand, if you are a better woodworker than me, you can buy just the metal kit for about $300.00 and build the wood frame yourself. If you go that route your main consideration should be methods for building your fly wheel. You can use concrete (I don't recommend it based on my experience, but then I don't do concrete very often). You can use bricks (this is how the Brent wheel works). I've even heard of using old car wheels and so forth if you're feeling creative. 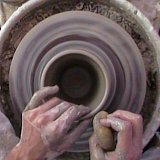 Whichever route you go, keep in mind that even if you make a few mistakes, like I did, you'll still be doing pottery and that's what it's all about.